Not all these web pages are translated in English. For specific information about the activities of our association, you will have to consult the Dutch version of our website. 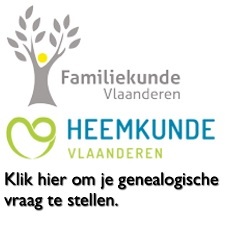 Familiekunde Brussel is an independent non-profit institution and a branch of Familiekunde Vlaanderen (Flemish Genealogical Society). Its work area is the whole of the Brussels capital region (the nineteen municipalities). supports, advises and supervises acknowledged socio-cultural and educational organisations. Do you want to practice genealogy on a systematic and scientific basis and maybe publish a family-history yourself? Are you looking for the proper software to arrange and keep genealogical data? Or are you looking for background information or lessons in old script? Would you like to meet other genealogists in order to exchange experience and data? Then you definitely have to become a member of Familiekunde Vlaanderen. On our Dutch page you will find more information on how to subscribe. Familiekunde Brussel does no personal survey concerning your family tree. But we can advise you. Specific questions can be posted at our electronic forum voor familiekunde en heemkunde. Questions in English are welcome. If you did not find what you were looking for on this page, you can ask your question by means of our contact form. Although this form is in Dutch, English messages are welcome and will be dealt with.